This may not be as interesting as multidimensional spirituality, but it may be useful to some people for a few years. Of course, the world of computing changes so fast that this will have no lasting value. But then again few things have in this world. Recently, the first reasonably fast USB memory sticks (memory keys) arrived. Before, it had been a handy but slow medium. And the capacity was not much to write home about either. Recently, we have got much bigger memory keys, and then we got a breakthrough in speed as well. The 16 GB Transcend JetFlash 600 dual-channel memory stick is noticeably faster, especially noticeable in writing speed, which is traditionally a bottleneck with flash storage. Actually, it is still a bottleneck, but it is a wider bottleneck than before. It is not all that useful to have a large memory that you have to leave overnight to finish writing. With its speed and capacity, this was ideal for my experiment: To install Linux on a memory stick. I had already made a small (2GB is small these days!) boot key with Ubuntu 9.10, the most recent complete version. There is a new version in beta, it should be official any day now, but it was in beta while I tested this. Since it is still planned for release in April, it is called Ubuntu 10.04 (the format is year.month). I have tried both of these. So I first made a boot disk / installer on the small, slow key. Then I used that to install Ubuntu Linux, but to the Transcend instead of to the main hard disk. 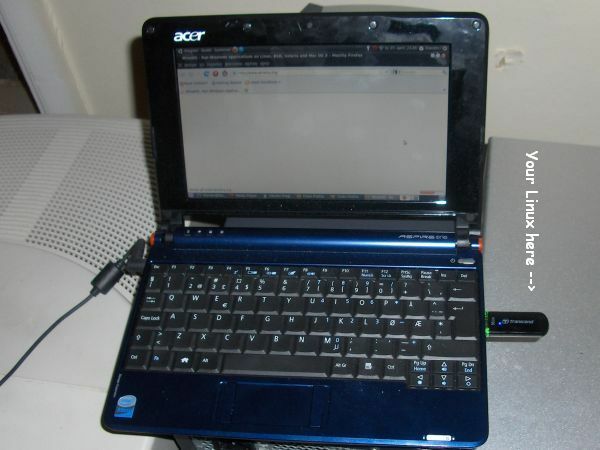 Both of the USB flash drives were on an Acer Aspire One, which is one of the earliest and weakest netbooks around. It does not even have a hard disk, only a flash disk, and a rather small one at that. Not having a hard disk or a CD-ROM saves a lot of battery power and weight, since there are no engines to spin, or moving parts at all. And since it already uses a flash disk, flash USB should not make that much of a difference. It did not, at first. When I chose at startup to boot from the Transcend, it took a little longer to boot, but it was still tolerable. And once it was up and running, I could have a couple programs open simultaneously, like listening to music while surfing the web. The test seemed to be a success. Seemed to. Having tested it with Ubuntu 9.10, I upgraded to Ubuntu 10.04. It was in alpha 2 at the time, a very early stage, even though the release was only weeks away. They sure have confidence. Of course, as with any large piece of software, it is sure to get a flurry of patches when a large number of people start using it for real purposes. With computer games, we call this phase “paid beta”, but Ubuntu (like most other Linux distributions) is actually free, despite the huge work that goes into it. Even so, if you are vaguely nervous around computers, you should wait 3-6 months after a new release before upgrading. With me it is the other way around, of course: I upgrade before it is even in beta. It was fairly stable, although the new features related to social media crashed every day. This may have been because I ran it from a USB memory key on a machine that was weak even when it was first released to the market, but which I bought when it was already long in the tooth, and that again was a year or two ago. Ubuntu makes no pretense at being super fast – that’s its little brother Xubuntu. So it seems one of the programs was terminated when it did not load within a certain time, which had been decided by the programmers with no regard for extreme cases like my setup. This was later fixed, but there were still a couple related programs that crashed. Of course, the program was still not finished at the time. It is still not released as I write this, the final date is April 29. Whatever the case, apart from having to start the gwibber (social media client) manually, it worked OK. Except that it grew slower and slower with each passing day. Then again each passing day saw me download perhaps a hundred or so updates to various and sundry programs and functions. I assume this was what slowed it down somehow, but I can think of no logical mechanism by which that would happen. Unlike a hard disk, fragmentation has no effect on flash drives. They don’t have a moving head – like the needle of an old gramophone – moving from place to place on the platter, like hard disks do. Solid state drives may write more slowly, but their read speed is unmatched. It probably reads as fast as the USB port and the processor can take it. Or should have. I still don’t know. I know that when I took the stick to the HP Mini 2 (with 2GB RAM instead of 0.5 GB) it ran fast enough again. Unfortunately, after I installed that day’s updates, something went horribly wrong. It worked fine afterwards, but the next time I tried to start, it did not run on either the Acer or the HP. It did not even get so far that I could diagnose it and learn what was wrong. So I wiped it clear, installing 9.10 from start again. I have upgraded it again, which took several hours as almost every part of the operating system was modified, or so it seemed. After this it runs fine again. I mean, it runs really well for a machine that is just barely more than a toy. Right now I have Opera running with 3 tabs, one of which plays streaming music. I also have a Terminal window open (same as a dos prompt in Windows) and the Ubuntu Software center where you can download innumerable programs for free. I am also in editing mode in an OpenOffice Writer document (roughly equivalent to Microsoft Word) and have open a movie player that has finished playing an Xvid movie that is stored on an external hard disk on my old Xubuntu machine. So that machine streams it over the local network to the USB stick on the netbook, which plays it. I played the movie with all these same programs open, except I did of course not stream music in Opera while playing the movie. There were a few cases of stuttering now and then through the movie when played in fullscreen mode, but not enough to make it unwatchable by any means. The one thing I can’t do with it is install new programs in the background while working. But this is most likely due to the weak processor. In conclusion, it works quite well – as long as it does not suddenly crash forever, like it did last time. You should not overload it with a large number of open programs on a machine with little memory though. Writing to flash memory is much slower than reading, and if the system needs to swap memory to the stick constantly it will slow down, even with a Transcend JetFlash. I was writing a long gray entry again, but stopped. Â It was a long day at the office, files kept coming in during the day and I had to do files for two of my coworkers who were absent. I was home a couple hours later than usual. And there has been the whole work week, with a little less sleep than I should have each night. Â Yes, my day is starting to slide again. I have been able to hold it constant for a while, using the Holosync Dive for half an hour or sometimes more in the morning, but lately it is sliding again. Â Well, enough about that. Â I don’t feel like writing an essay tonight, let that be enough. In other news, Linux (the freeee operating system) is progressing slowly but surely. Â Last year, getting flash content (such as YouTube) to run in Opera under Linux was still hit & miss for me. Â This time, I still had to look it up online, but it only took half a minute or so to actually get it to work. Â So now I can play my brute in my browser window, although Tsaiko’s brute still flattens me in a moment. It took me considerably more time to get the ICE (NMT) wireless broadband to work under Xubuntu Linux. I am not sure why, but I never got that to work before, which is why I bought the Vista laptop in the beginning of 2008. Now another Vista machine has been Linuxified. No more worrying about worms, virii, keyloggers and identity theft, all the usual stuff that Windows users have hanging over their neck day by day. Â (Of course, I still have to not be a complete bumpkin that clicks on any mail claiming to be from my bank or Ebay politely asking me to enter my data again to avoid my account being closed. Â Seriously, some people need to not use computers, or talk to strangers, alone.) Although the computer was more than strong enough to run Vista, so I won’t have that benefit (Linux runs better on older or weaker machines). Oh, and another glass jar recycled! Wheee! Â Just twenty or so left. This morning I decided to skip the Holosync session. After all, I had slept 7 hours, slightly more than I usually did before I even started these experiments. Besides, I was planning to do a 40-minute LifeFlow 10 today, the first of these. The demos have tended to make me more sleepy rather than less, but that would be a concern for the afternoon when I did that brainwave entrainment. But already on the commute bus to work I became very sleepy and napped for much of the way. Â This is something that rarely ever happened even before I started syncing in the morning. Â Perhaps if I slept only half the night or if I got up very early. But I was actually half an hour late (thank you, large intestine) and had slept for 7 hours. Â Huh. Â At work I became sleepy again after lunch, although 10 minutes of focused counting meditation cleared that up. Â Still, later in the workday I became sleepy AGAIN and napped for 10-15 minutes. Â Either the brain does get used to the morning sync or it has a really good placebo effect! Still haven’t gotten along to testing the “industrial strength” version of LifeFlow as of 20:10 (8:10 PM DST). This is because of the Linux laptop. Â I have used it almost exclusively to play music at work for a good while now, but I can do that with the Vista laptop. Â It just isn’t as easy with iTunes as it is with Amarok, the KDE music player. Well, that probably does not tell you much unless you came here by searching for Amarok, KDE, or “Linux music” – and I sincerely hope this entry is many pages down on any of those searches! Anyway, I don’t play much music anymore. It happens, but it has diminished greatly of late, and more so now that I can directly hack into my brainwaves with low-frequency sound effects. Between this and the speeches of the “researchers” in this area, my “recently played” list looks nothing like its old self. Â So I took the old HP pavilion ze5600 with me home finally. This ties in with my rant about Norton antivirus, last seen in my March 27 entry. Â With my relationship to Â Symantec back to enemy level (I know it’s been there once before) there is only a firewall between me and an Internet raging with worms. Â Unlike viruses, which passively drift along with stuff you download (mail included), worms are actively trying to get into your computer and infect it through any one of the many thousand ports that opens you to the Internet. Â The obvious solution is to have a firewall, which closes all these ports (think of them as small holes that worms may worm their way through). Â My router does indeed have a great firewall, but… it gets in the way of downloading Japanese cartoons. I have had neither the time nor the inclination lately to watch such “anime” as it is called. Â But this is things that have come and gone in the past, although the fad seems to be slightly weaker each time it returns. Â It seems like a reasonable goal to at least complete the series I have begun. Â Besides, while it may be technically illegal, I still see it as a valuable cultural exchange that I should encourage. After all, it is not like you could rent these in your video store – or indeed any video store in the western world. Â Some of them are even hard to find in Japan anymore. Anyway, the short of it is that someone needs to run BitTorrent without a firewall, and if that someone is me, the worms don’t die. Â This is where Linux comes in. Â The small laptop has Ubuntu Linux instead of Windows, which means worms won’t work on it. Â The two operating systems may do many of the same things, but they are very different inside. Â Worms are all written for Windows, except possibly one or two for Mac. Â Linux has simply too many different variants to be worth writing a worm for. It is not that it is impossible, perhaps not even harder than for Windows, but you will only infect a few machines, and then they change again. Â So, by putting my Linux laptop on the network, I can download and upload anime without getting worms. Of course, first I had to get the machine home. It is just a laptop, and I carried it in a suitable box along with cables and such. Â It was not really heavy, but it still felt heavy after I had carried it long enough. Â (I walk about 15 minutes from work to the bus station, and around 10 minutes from the bus stop home.) Â My arms are ridiculously weaker than my legs now after I have not trained with the bow since I moved here, or years anyway. Â I really should starting carrying a box with a laptop to work and back every day, except it would look kind of weird in the long run. Connecting to the home network, however, was surprisingly difficult. Â I know I have done it before with an earlier laptop. Â And the Ubuntu installation on Trine the tri-core computer accesses the network without a second thought. Â But the laptop simply could not open the network named “ITLAND”, although it managed to see that it was there. Â (It also saw a network named “WORKGROUP” that is the default Windows network, I believe, but that I thought I had removed. Â This cannot be opened either. I manage to set up access to one shared folder by using another alternative (Linux is big on alternatives). I used the choice “Connect to server” and gave the internal IP adress for the computer where my anime is stored, and the folder name on the network. Â So I got around it that way. Â I was also able to connect to part of the network for a while by running the network wizard on the Windows XP machine again with the same network name as originally and no other changes. Â But it faded after a while, for unknown reasons. Â I will probably continue to hack on it from time to time, but the temporary solution is good enough for what I wanted to do right away, Â get more episodes of Astro Fighter Sunred, an old parody on the Japanese version of super heroes. Why do I have to hack and rig these things anyway? Â I should be able to rent the anime I want to see directly from the Japanese company that holds the copyright, and stream it directly to my computer using safe, reliable components of the world’s leading operating system. Â There should be no need to hack, fudge, jury-rig or improvise, rely on the kindness of strangers and tiptoe on the shady side of the law. Â Come the revolution, this is all going to change! But for now, Linux is the most revolutionary we have. And it gets the job done, with a little help from the Google.